Climate Perks is designed for people who love travel and want to take action on climate change. If that’s you, cutting down on flying will likely be one of the most important things you can do to cut your carbon. 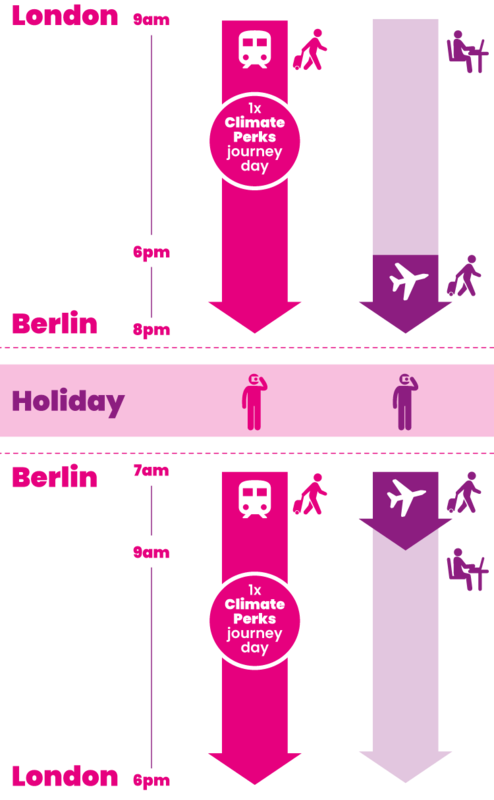 That’s because air travel carries a heavy climate cost: a single return flight to Berlin clocks up the same amount of carbon as eight return trips by train. Most of the time, trains, coaches or boats take longer than a trip through the sky. Working for a Climate Perks employer means you can choose clean travel without losing out on your hard-earned leisure time. Each year you would be offered at least two paid ‘journey days’. These are for you to use to travel to and from your holiday destination without heading to the airport. Clean travel means using transport that is much lower carbon than a plane. In practice that means trains, coaches and boats. Europe is blessed with some of best transport networks in the world, with several world-class high speed rail systems and a host of organisations dedicated to helping plan and book your journeys. Travelling by land or sea is a chance to rediscover the magic of the journey - whether that’s racing under the seabed in a Eurostar, winding through stunning scenery in the alps or waking up after a night journey in the heart of a new city. And by coming onboard, you’ll be helping encourage others to follow in your footsteps. It’s time clean travel took off: be part of making it happen.